Groups allow you to see, view and edit information for a single group at a time so that you are not overwhelmed with too much information. Groups are set up by your administrator. 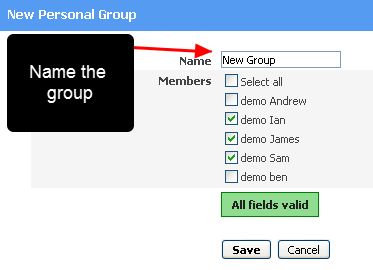 Accessing the personal groups module allows you to set up your own personalised groups to help speed up data entry, or run analysis for a specific group of athletes, e.g. special groups such as injured, need motivating etc. 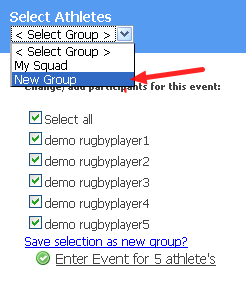 View your groups (left of the page) or Click "Create new Personal Group"
Name the New Group, tick the Athletes, Click "Save"
When you click to Enter data for a Group (discussed in the Enter Data for a Group Section), the new Personal group will be available here for selection. If your Personal Group does not showing , then see the step below. You can always double check that you created the groups by clicking on the personal groups link (top right of the home page) to review your personal group again. Went to Enter Data and the Personal Group was not showing? Check your Group of Athletes. If you created a Personal Group using Athletes from a subgroup of athletes e.g. 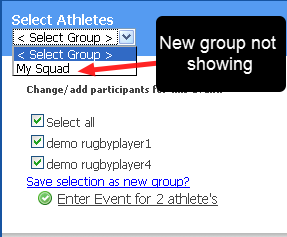 the First Team (e.g New Group as shown in the step above) and then you change to view the Second Team athletes, the personal group created from the First Team athletes WILL NOT SHOW, because none of those athletes are they Second Team which is the group that you are viewing. Change the group that you are viewing back to the Group that your Personal Group was made from and try again. For more information on Groups, see the Groups section of the Help Manual.